About the Book: Frederick is an apprentice in a clockwork shop who is secretly working on his own clockwork man in the hopes of making journeyman. Hannah is a maid working at a hotel trying to raise money for her family and sick father. When she hears of the possibility of a treasure, Hannah decides to seek her fortune. Giuseppe was kidnapped from his home in Italy and works as a street musician. He dreams of returning home and when he finds a green violin, he wonders if it holds to key to his passage. The stories weave together and the three learn that they must work together to help each other solve their problems. 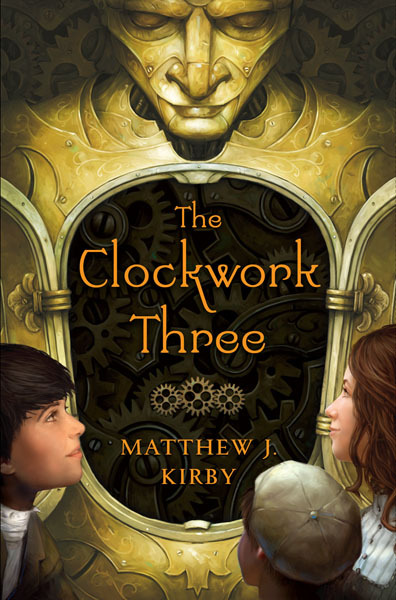 GreenBeanTeenQueen Says: The Clockwork Three was a book I picked up at ALA last year and even heard the author read from, but nothing about it really sparked my interest. Then I had to read it because of committee reading, so I picked it up. I liked the book to start and I really enjoyed all three characters. They were engaging and interesting. I did listen to part of it on CD and I was a bit annoyed by the narrator's voice for Frederick-he made him sound "nerdy" which was somewhat distracting. But I think that only came through on audio since I didn't get that when I read portions of the book. I really liked how the author ended up weaving all three storylines together, although it did take awhile for it to happen, so readers might need some patience to get there. I also felt the ending sort of fizzled out. The explanation of Hannah's treasure, the clockwork man Frederick has been working on, and Giuseppe's green violin all seemed to contrived and coincidental. This annoyed me since I thought once the book got going, it was really interesting and I was eager to see how everything turned out. Instead it just sort of quietly ends and in some ways it felt like the author was trying to wrap things up too quickly (which is odd for a book that's 400 pages long!) I would have liked less build up and a more fleshed out ending. I do think The Clockwork Three would be a great book for tweens who are "reading up" and looking for something a bit heavier to read. I also think it might hold interest for young readers starting to become interested in steampunk. While this isn't necessarily steampunk, the storyline with automatons and the clockwork man might be of interest to steampunk readers. Book Parings: The Invention of Hugo Cabret by Brian Selznick, Larklight by Phillip Reeve, and maybe even Magic Under Glass by Jaclyn Dolamore for readers who enjoy automatons. I have been wanting to read this one for a while! It looked really interesting (especially the cover). This one definitely looks interesting--going to add it to my 'to read' list on Goodreads asap! Thanks again for this great meme-I'm trying to get more familiar with what's out there for the tween and your posts always help!